StarWind Virtual SAN software coupled with Mellanox Ethernet-based high speed end-to-end infrastructure accelerates storage solution networking connectivity and lowers overall power consumption. Storage networking software provider StarWind used Mellanox Zorro cluster to run StarWind iSCSI Initiator on HP DL380 systems with Mellanox ConnectX-2 40GigE NICs. Full performance benefits were realized over the maximum bandwidth allowed by the PCIe Gen2. A record level of 27Gbps throughput and 350K IOPs were achieved. The solution provides faster access to the storage data in an iSCSI fabric. Current data centers require frequent high speed access between server and storage infrastructures for timely response to customers. Web-based service providers, such as infrastructure as a service (IaaS) or platform as a service (PaaS), provide high speed access to their customers while keeping infrastructure costs low. For a cost-efficient and higher speed requirement, 40GigE infrastructure combined with software-based virtual storage provides the best solution. StarWind Virtual SAN software running over a Mellanox ConnectX ® -2 40GigE networking solution provides better performance, high availability (HA) and redundant virtual storage solutions at 40Gb/s bandwidth and higher IOPs. The installation time for StarWind Virtual SAN is very short, and takes only a few minutes. It requires no reboot and is entirely plug-and-play with no downtime. Under Mellanox Enterprise Datacenter’s initiative, StarWind used Mellanox Zorro cluster (See: www.mellanox.com/content/pages.php?pg=edc_cluster), to run StarWind iSCSI Initiator on HP DL380 systems with Mellanox ConnectX-2 40GigE NICs. 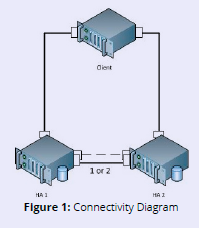 The servers were connected, as shown in the connectivity diagram below (Figure 1). Full performance benefits were realized over the maximum bandwidth allowed by the PCIe Gen2. A record level of 27Gb/s throughput and 350K IOPs were achieved. The higher speed solution provides faster access to the storage data in an iSCSI fabric. With non-HA configuration (the only node called HA 1 and the client were performing I/O through the single 40Gb/s connection in both directions utilizing full-duplex Ethernet) cluster got 25Gb/s of an iSCSI traffic (due to PCIe Gen 2 system limitations full 40Gb/s wire speed was not reached). Tests with updated PCIe Gen3 hardware wire speed of 40Gb/s over iSCSI can be achieved, without any change in networking hardware, software and StarWind Virtual SAN. 300K IOPs at 25Gb/s were achieved with 16 clients using StarWind Virtual SAN. This represents a superior performance gain over current iSCSI HBA solutions. The full HA version (both with HA 1 and HA 2 nodes are processing requests served under Round-Robin policy) achieves the same results as the non-HA configuration but with more workers and deeper I/O queue, which is a shortcoming for Microsoft SW initiator. Every single write went through the wire twice: first from Client to HA 1 (or 2) and then from HA 1 (or 2) to HA 2 (or 1), partner HA node before it got acknowledged as “OK” to Client. Full HA versions can reach non-HA performance with heavy and non-pulsating I/O traffic. A full set of graphs for both IOPs and Gb/s are published below. System RAM was used as a destination I/O target, which mirrors the rising trend of SSD usage in storage servers. A traditional storage stack (another PCIe controller, set of hard disks, etc.) would only add latency to the whole system and limit performance. Consolidating over 40Gb/s networking solution for iSCSI in a virtual environment is recommended for blade server setup, as it will replace four 10GigE individual links. Trunking over 4X 10Gb/s links to achieve 40Gb/s does not work well for iSCSI, as 4KB iSCSI PDU will crawl through only two of four cards put into the trunk, leaving half of the theoretical bandwidth under loaded. Increased latency with trunking and combined four 10Gb/s cards at a higher cost compared to single 40Gb/s makes consolidated 40Gb/s a more future proof option. 1) Fewer PCIe slots have been used to achieve the same bandwidth (one instead of four). 2) Less cables between cluster nodes. 3) Lower power solution (single silicon powered and one copper wire instead of four). 4) Easier to install and manage. 5) Superior scalability solution – higher bandwidth can be achieved using the same number of slots. Using StarWind Virtual SAN with Mellanox ConnectX-2 EN Adapters plus 10Gb/s or higher speeds (preferably 40Gb/s), for current and future x86 servers along with PCIe Gen2 and PCIe Gen 3-enabled systems, is the most cost and power-efficient software-based iSCSI end-to-end solution for virtualized and non-virtualized environments. Most cost and power-efficient software-based iSCSI end-to-end solution for virtualized and non-virtualized environments.